Here is a quick update on some current work at Pontydysgu. With funding from the European Lifelong Learning Programme G8WAY project and the European Research Framework Mature-IP project, and working with a growing community of partners, we have been developing a series of Web 2.0 tools to support careers guidance. At the moment we are developing a new web site which will give full access to these tools and applications, as well as to research about the use of Web 2.0 and social software for careers information, advice and guidance. Below is a summary of these tools. If you are interested in finding out more about any of these tools or about our approach to using technology to support careers guidance please get in touch. We are developing tools and applications for visualising Labour Market Information in order to provide young people with an informed basis for decision making around career directions and to support the careers guidance professionals who advise young people. This work has been undertaken in conjunction with the Institute for Employment Research, University of Warwick and Careers Wales. RadioActive is a project using internet radio to assist young people, particularly those from a NEETS (Not in Employment, Education, or Training) background in developing decision making and communication skills. This approach focuses on informal learning and the development of communities of practice through the use of new technologies. The approach is being piloted in conjunction with the University of East London, Yoh, a Hackney based youth agency, and Inspire!, the Education Business Partnership for the London Borough of Hackney. Storiboard is a Web 2.0 tool for storytelling. In the first year of the G8WAY project we found that storytelling is a powerful tool for developing and reflection on careers biographies. Storiboard allows young people to use multimedia including video, audio and graphics to tell their careers stories and aspirations. It is initially being tested through using the original stories collected in year one of the project and will then be piloted with UK based careers services. We are developing a series of Web 2.0 webquests designed to support professional development for Careers Guidance professionals. The first two are on the use of the internet for Careers Guidance and on careers in Science, Technology, Engineering and Maths (STEM). Along with our technical partners, Raycom, we are developing a lightweight repository which combined with the Storiboard interface, will provide for easy editing and development of Webquests. Ilona Buchem proposed to me and Ricardo Torres that we should undertake a systematic review of literature on Personal Learning Environments as our contribution to this years PLE conference held in early July in Southampton. We set out to review some 100 journal articles and blog posts in three langauges. ● A bottom tier with a set of core concepts and a scale from “high” to “low”. However, the first reading and analysis of selected literature led us to the conclusion that focusing only on the three dimensions at the top tier level as described above leaves out other central aspects related to PLEs. At the same time the three original categories are too broad and encompass different notions that need further disaggregation. Thus we decided to use Activity Theory as a basis for our analysis reasoning that the idea of PLEs places the focus on the appropriation of different tools and resources by an individual learner and there is a general agreement on viewing learners as being situated within a social context which influences the way in which they use media, participate in activities and engage in communities. Learning outcomes are considered to be created in the process of tackling the problems and challenges learners meet in different contexts by using tools and resources leading to outcomes. The perspective on learning as tool-mediated, situated, object-directed and collective activity is the basic tenet of Activity Theory (Engeström 1999; Engeström, 2001). What types of ownership and control are relevant to PLEs? What motivates and demotivates learners to establish own PLEs? Which norms and values guide the development of PLEs in different contexts? What roles are played by different actors in a PLE? What is the relationship between ownership and collaboration in a PLE? How do PLEs contribute to identity development? How to balance power between different participants in a PLE? How to support the development of literacies necessary to establish a PLE? You can read the full paper below or download a copy. We would very much welcome feedback from readers. Thanks especially to Ilona for all the hard work she put in in getting this paper ready for publication. Center for New Media, has analyzed data from more than 41,000 American adults surveyed between 2000 and 2008 in the Pew Internet and American Life Project. She found that college graduates are 1.5 times more likely to be bloggers than are high school graduates; twice as likely to post photos and videos and three times more likely to post an online rating or comment. Last week we traveled to San Marino to organise a workshop on internet radio at the San Marino Arts Festival (SMIAF) and to broadcast the festival. 100 music events, theater, circus, photo, art, culture and appetizers-meetings, the event gives voice to young artists of Knowledge, professionals and creators of San Marino, Europe and the World. The Festival creates a “social network” real and human in the ancient Land of Liberty to meet, interact, learn and create new knowledge. SMIAF Project aims to promote, also throughout the year, a new and more valuable visibility for the country both locally and internationally. But this fails to convey the real excitement. The festival is run by volunteers – young people from San Marino. They have only a small budget and much of that is money raised by them. And there is a real buzz about it – enhanced by the venue. The old city of San Marino is perched 800 meters up on a mountain with small winding streets. There are ten festival stages with steep climbs between them. We met for the workshop at about four in the afternoon on the Friday. The workshop, held outside in one of the main squares, was a little complicated in that we did not speak Italian and most of the volunteers spoke only limited English. But with help from Anthony, our Maltese translator we got by. This is the fourth internet radio workshop we have run this summer and although they vary a little according to time and numbers, the format and content is much the same. We introduce them to the equipment and to how internet radio works, then we run a storyboarding workshop to get ideas for content and formats for the broadcasts. This is usually followed by a session where participants decide what roles they will take responsibility for – producers, floor managers, technicians, music, journalists etc. Then it is down to the hard work of preparing content and getting out publicity through social networks whilst at the same time practicing interview techniques and how to use the microphones. The workshops are always pretty chaotic but a lot of fun. With previous workshops teh aim has been to produce a 30 minute programme. In this case we ended up broadcasting from four in the afternoon until ten o’clock on the Saturday and on the Sunday we ran on to well past midnight. What is particularly satisfying is the enthusiasm and speed of learning which happens when participants have a real and authentic task – to broadcast live radio. And the live element provides an adrenaline rush which a participant at a previous workshop described as being “better than drugs”. It is also great to watch how participants fuse together as a team and take on different roles and responsibilities in the process. 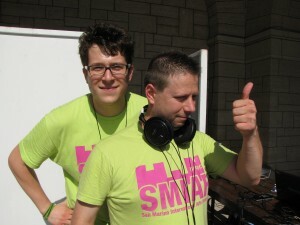 The SMIAF radio programme has a longer term aim than the festival. San Marino has only one radio station and that is government controlled. To the best of our knowledge the festival marked the first internet radio broadcast from San Marino. And our intention is to develop internet radio in San Marino starting with a podcast serie4s from the autumn and leading to the launch of live internet radio next year. It was a great weekend. Thanks to all who helped us – the SMIAF organizers, the technical support but above all all those who joined the SMIAF radio team over the weekend. We hope to see you all again soon. Badges seem to be the coming thing on the tech developers horizon. Soon we will have badges for everything. Cynical as I might be I am very interested in this Mozilla project to develop badges to recognise learning. It is really a very simple idea. The Open Badges framework, say the project developers, is designed to allow any learner to collect badges from multiple sites, tied to a single identity, and then share them out across various sites — from their personal blog or web site to social networking profiles. The infrastructure needs to be open to allow anyone to issue badges, and for each learner to carry the badges with them across the web and other contexts. I think the project is interesti9ng in that it recognises the increasing diversirty of learning pathways and contexts. It also recognises that in the future it is on line web presence which will for4m the primary iddentioty for a job seeker, ratehr than teh now old fashioned CV. But rthere are still potential issues. The credibility fo the badges swil depend on the credibity of the organisationw hich issues them. And attempting to classify differents orts of badges holds many perils. I don’t agree with teh distinction between badges for ‘skills’ and ‘community /peer’ badges. but i would love to see this project rolled out – possibly linked to Open Education Resources – anyone ideas for a trial around it?